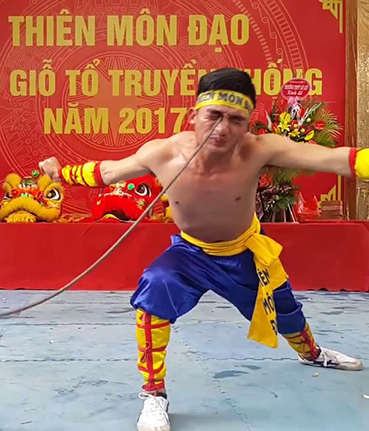 Since bygone days, in Martial Art Martial, the goal of Codified Sequence this was the training for from the knoweledge of « Fighting with Bare Hands » to level of knoweledge of « Fighting with Medieval Weapons » belonged to the Eighteen Sections of Martial Arts (Thập-Bát Ban Võ-Nghệ). The Etymology of the word Võ 武 (ie. Martial) shows us that it includes the character Chỉ 止 which means To Stop and the character Qua 戈 which means antique Halberd. Engraving under HÁN Dynasty ( 漢 朝 ) - 206~220 AD. 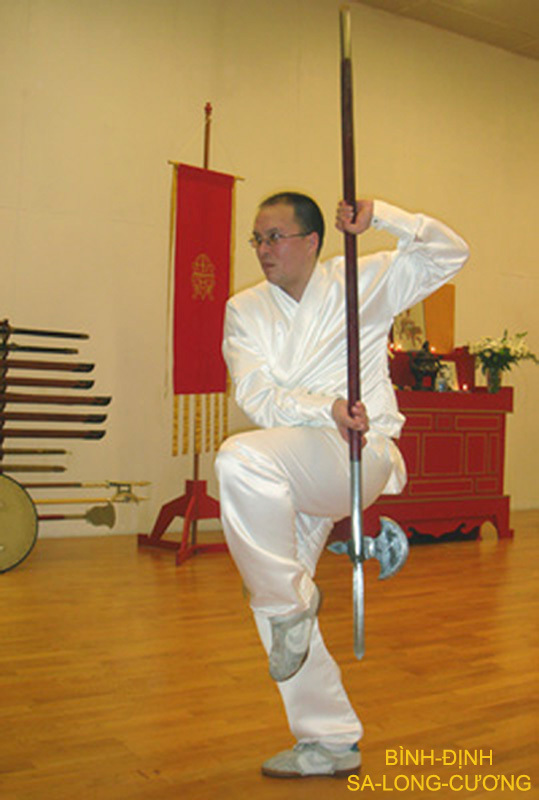 Thus, it's obvious that Martial Student requires the possibility to learn the method for stopping the Halberd. Then, what method is it best than those of learning the « Medieval Weapons Fighting » ? - Because a person knowing to fight with bare hands cannot at all to mesure one's strength against a person knowing to fight with a medieval weapon. 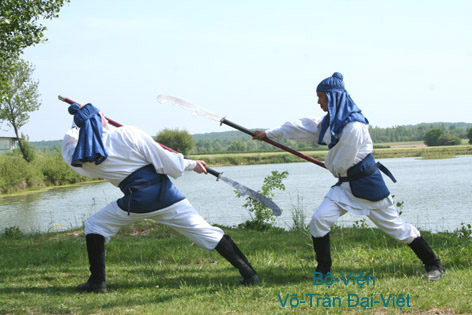 That's why, the Traditional Martial Arts and Battlefield Martial Arts recommend all to train Martial Student for the wielding of weapons inherent in the Eighteen Sections of Martial Arts. from Bình-Định SA-LONG-CƯƠNG School System. 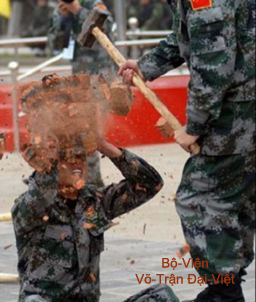 of Great Battle Axe « Đại Phủ-Việt » ( 大 斧 鉞 ). Usually, we see that only persons who don't know really the weapons wielding likes to make the demonstration of mastering with bare hands an armed person. 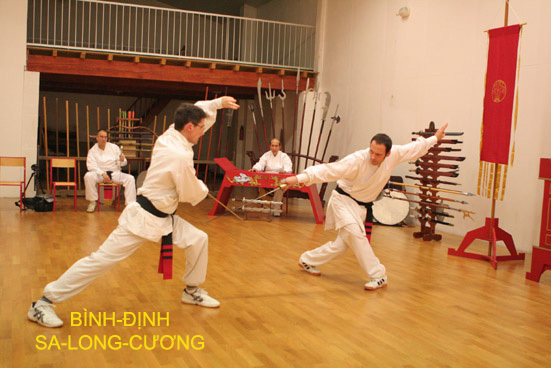 As for the case of person knowing the weapon wielding and who goes to make the demonstration of the mastering a person bearing an arm, that is he wishes only for explaining clearly the Martial Arts Principle in the drill hall, et not to prove tangibly the Martial Arts Principle on the battlefield. 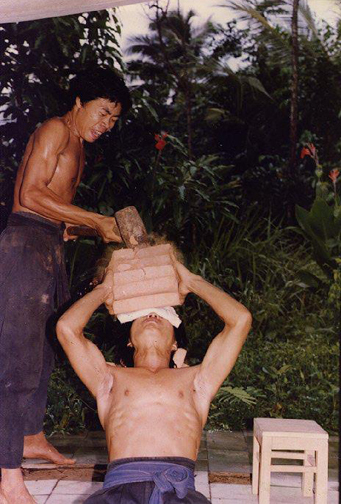 As far as persons who perform demonstrations of the Spear bending by advancing one his point placed on the throat, or well of the broken tests as to break tiles and bricks with the edge of hand, or well still, for example, to seat down in order to permit someone to break tiles and bricks on the head with a hammer or to stretch oneself out on the back in order to permit someone to use the hammer for breaking tiles and bricks put on the forehead, the chest or the abdomen, that's they wish for to demonstrate their training level in the Work of Hardening (Ngạnh-Công ) and not at all in the Work of Martial Arts (Võ Công). 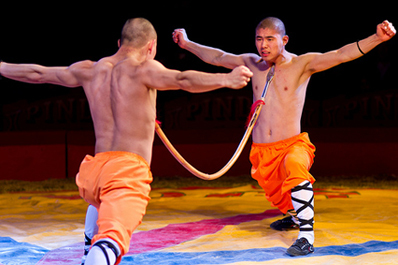 (Please, read Article from Journalist Ngọc-Huyền « Why Special Forces of Pekin "turn their back" away exceptionnal techniques of Shaolin Martial Arts ? - Vì sao Đặc-Nhiệm Bắc-Kinh "quay lưng" với tuyệt-kỹ Võ Thiếu-Lâm ? 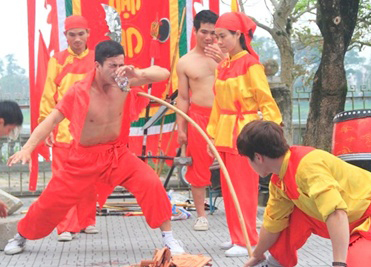 » on the WEBpage News in the Country - Tin Trong Nước from WEBsite http://vocotruyenvn.net ). 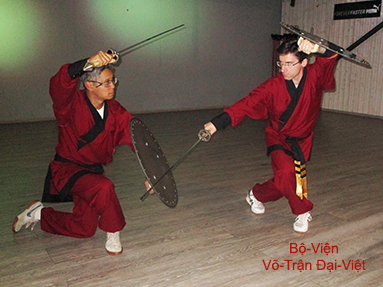 Martial Arts School from Việt-Nam..
at Tây-Sơn Bình-Định from 1-08 into 4-08 2014. However, these exhibitions lean the most often on clever subterfuges which can not at all escape the eyes from a person knowing Martial Arts in general and medieval weapons wielding in particular. 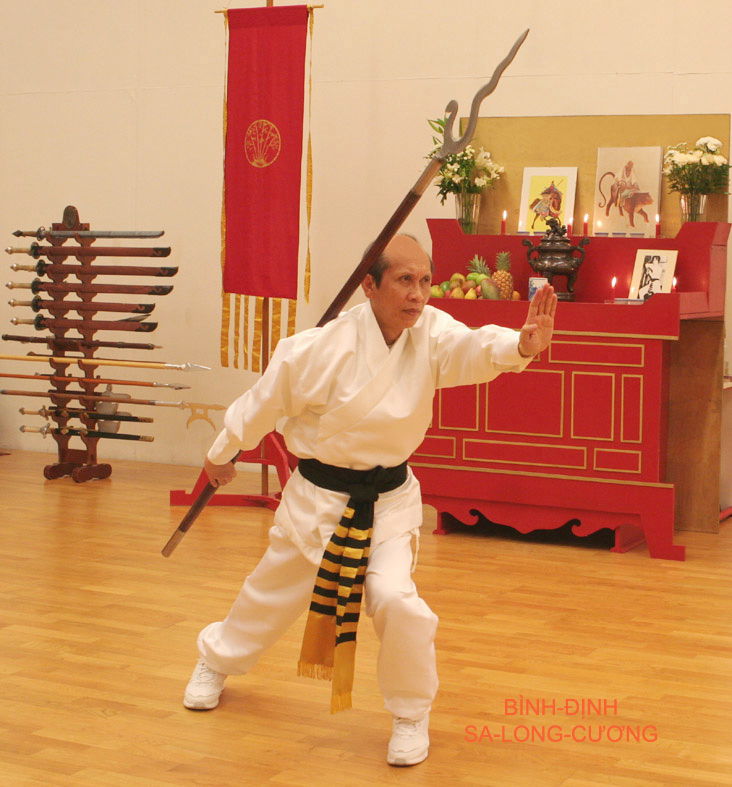 The Work of Martial Arts (Võ Công) crystallizes from the Martial Art and the Breath's Work (Khí-Công), and that's why Martial Art is all a Fighting Art with an Experimental Science of the Ancients on battlefields. By consequent, weapons inherent in Eighteen Section of Martial Arts and their wielding's methods sprang up in medieval military campaigns. And because they sprang up in medieval military campaigns, these methods have been tested by these later with a concret way for containing an absolute pedagogic value. It's well and truly the reason that why we must not falsify and modify Codified Sequences from the Ancients, or make up the new of them. 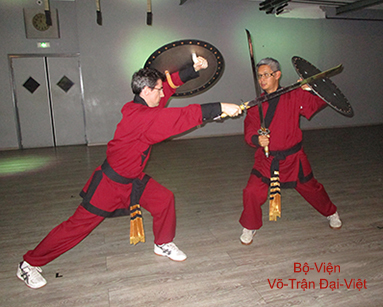 The Traditional Martiaj Arts from Đại-Việt have been always compared - by our Old Gran-Masters par nos Vieux Grands-Maîtres precursors - with the « Filled Cake - Bánh Chưng », whom the part concerning the « Cake - Bánh » represented « Codified Sequences of Bare Hands Fighting » while the internal « Filled Core - Nhưng » represented « Codified Sequences of Medieval Weapons Fighting ». 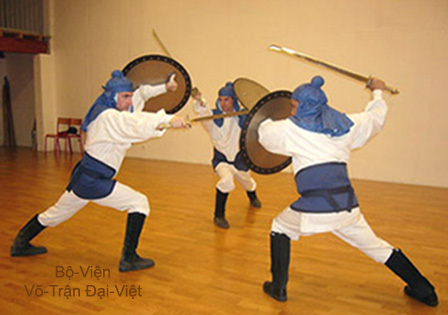 In other tems, the training for Medieval Weapons wielding is the essentiel thing in Traditional Martial Arts from Đại-Việt, because there are « Martial Arts for fighting on Battlefields », and not « Martial Arts for fighting on the Ring ». 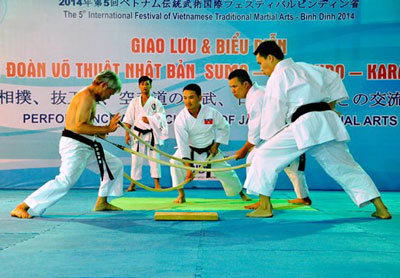 The « Martial Arts for fighting on Battlefields » include all a Message of Culture and History from Việt's Ancestors with an obvious manner that « Martial Arts for fighting on Ring » do absolutely not bring beyond the fact to follow their time doomed to influences of foreign countries and to flatter the politique power established inside the nation. 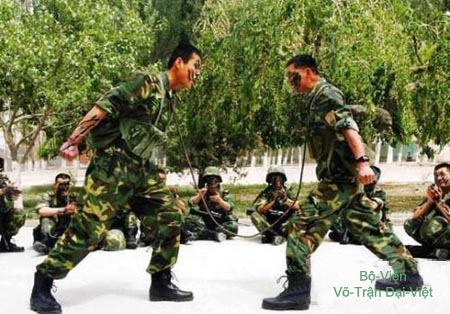 In addition, Martial Student requires to train for with truth weapons, whom weight is logic, in order to be able to assimilate chain techniques in Codified Sequences. 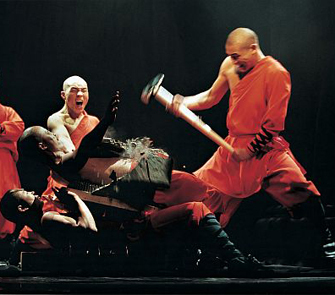 The experience have showed that martial students, training for with false weapons, wrongfully built in aluminium whom weight is too light, have all abused this fact for wielding them too hurriedly in view to acquire maximum speed. 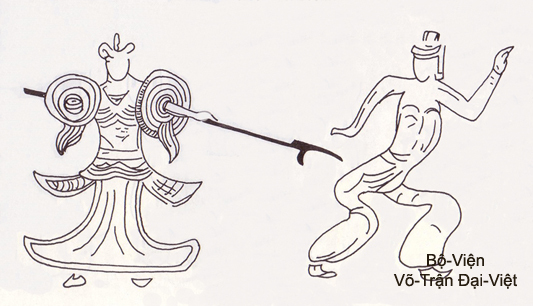 That why, chain techniques of weapons wielding in Codified Sequences are erroneous because of the incompleteness of attacks and defences chain techniques due to erroneous postures and disorderly moving. 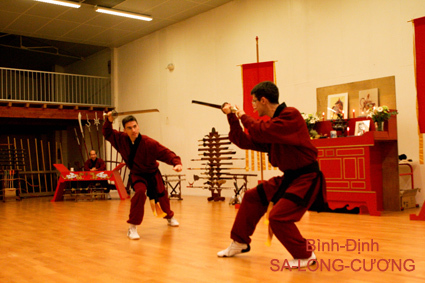 Afterwards he trained for to be well accustomed to Codified Sequences of Medieval Weapons, Martial Art Student will need to learn the method of « Medieval Weapons Fighting » concerning each category inherent in Eighteen Section of Martial Arts. 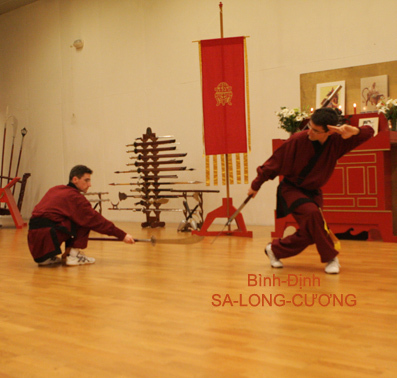 « Pole-Arm "Phác-Đao », on foot Fighting. 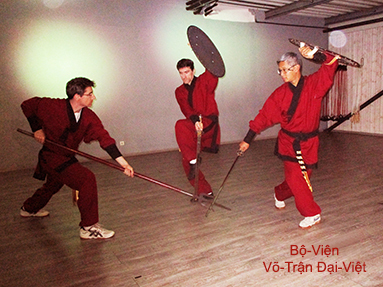 with « Shield and Sword », on foot fighting.